I really enjoyed the meeting. My fellow committee members are tremendous company, as you would expect – and we all share a real passion for World Scouting. We debated firmly, but cordially – and it was very clear that, under the chairmanship of Rick Cronk, (pictured here), we all share a commitment to support World Regions and National Scout Organisations in having a real impact on the lives and aspirations of young people. 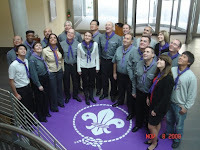 Among the many subjects on the Committee’s agenda were: follow-up to World Scout Conference resolutions and the recommendations from the World Scout Youth Forum; the process to be followed for the appointment of the Secretary General and the feasibility study on the location of the World Scout Bureau; the Triennial Plan for 2008-2011 and the annual operational plan and budget for the current fiscal year; constitutional, relationships and financial matters; and future World Scout Events. We’ve got a short two years before the next World Scout Conference in Brazil – and lots to achieve in that time. It’s going to be a challenging, but I think highly rewarding time.